Kitchener Rangers forward Greg Meireles has been named the OHL Player of the Month for March, finishing tied for the league lead with 18 points including five goals and 13 assists over eight games. 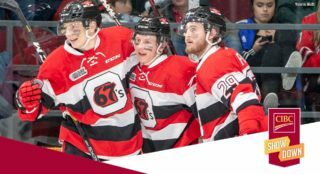 Meireles recorded points in all eight contests as part of an ongoing 20-game point streak, the OHL’s longest of the 2018-19 season. The 5-foot-11, 188Ib centre recorded at least three points three different times including a three-assist showing on Mar. 1st against London, a goal and three assists in an 8-4 win over the Erie Otters on Mar. 8th followed up by a goal and two helpers on Mar. 10th in Guelph. Meireles potted a pair of power play goals to help the Rangers’ top-ranked power play finish the season with a 29% success rate, the league’s highest since the 2016 Memorial Cup champion London Knights. He also had a hand in helping teammate Jonathan Yantsis reach the 50-goal mark, assisting on four of his goals in the month of March. A 20-year-old native of Ottawa, Ont., Meireles finished the season as Kitchener’s leading scorer, recording 97 points 36-61–97) over 68 games, 43 of which came on the man advantage. Meireles led the Rangers with 249 shots on goal this season and went 54.1% in the faceoff circle. The former first round (12th overall) pick of the 2015 OHL Priority Selection remains without an NHL contract but attended rookie camp with the St. Louis Blues in 2017. 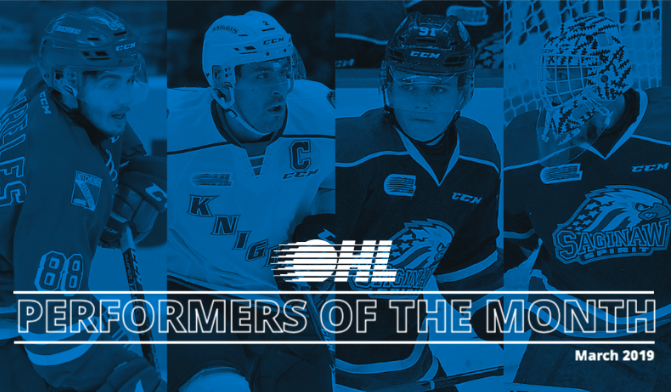 For the second straight month a London Knights blueliner has been named the OHL’s Defenceman of the Month. Edmonton Oilers prospect Evan Bouchard takes the torch from teammate Adam Boqvist, recording nine points including five goals and four assists over eight games for the Midwest Division champion Knights. The veteran captain started the month with a season-high four point performance, scoring while adding three assists in an 8-6 road win over the Kitchener Rangers on Mar. 1st. 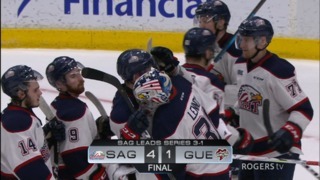 Bouchard also found the back of the net in a 3-2 overtime win over the Flint Firebirds on Mar. 8th before recording back-to-back two-point contests to close out the month, helping the Knights lock down first place in the Western Conference. He scored twice in a 6-3 road loss to the Soo Greyhounds on Mar. 15th before scoring a goal and an assist in a 5-2 win over the Saginaw Spirit on Mar. 16th. Bouchard recorded at least five shots on goal on five different occasions in the month of March. 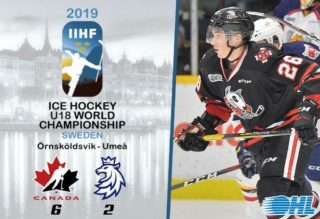 A 19-year-old product of Oakville, Ont., Bouchard recorded 53 points (16-37–53) over 45 games in an abbreviated season after returning from the NHL’s Edmonton Oilers where he played seven games and scored his first goal to start the campaign. Bouchard’s 201 career regular season points (54-147–201) sit second in franchise history for defencemen behind Rick Corriveau (1987-92). Originally London’s first round (17th overall) pick in 2015, Bouchard was chosen by the Oilers with the 10th overall pick of the 2018 NHL Draft. 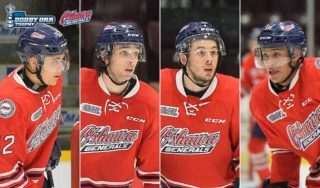 Cole Perfetti‘s tremendous rookie season continued this past month as the Saginaw Spirit winger has been named OHL Rookie of the Month for a second consecutive term. Perfetti led all rookies with seven goals along with four assists for 11 points over eight games along with a plus-10 rating. The 5-foot-10 left-winger helped the Spirit secure its first West Division title since 2011, putting up three different multi-point performances beginning with a goal and an assist in an 8-0 win over the Peterborough Petes on Mar. 3rd. He put up a season-high four goals in a 4-1 road win over the London Knights on Mar. 9th, becoming the OHL’s first 16-year-old rookie to do so since Peterborough’s Ryan Spooner in March 2009. Perfetti followed that sterling performance up with a goal and two assists on Mar. 12th as the Spirit took a 6-2 road win over the Sarnia Sting. In total, Perfetti earned Three Star recognition three different times in the month of March. 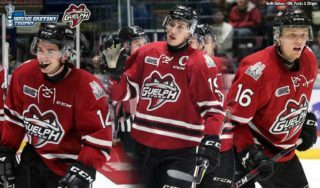 A 17-year-old native of Whitby, Ont., Perfetti finished the season tied with Owen Tippett for the Spirit scoring lead, recording a league-leading 74 points (37-37–74) among rookies over 63 games. Perfetti’s 37 goals are a new Spirit franchise record for rookies as he finished with the OHL’s sixth-highest shooting percentage of 22.4% while netting seven game winners. 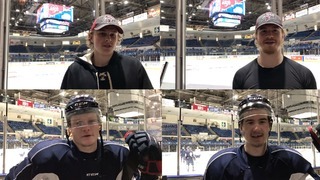 Eligible for the 2020 NHL Draft, Perfetti was Saginaw’s first round (5th overall) pick in the 2018 OHL Priority Selection from the Vaughan Kings Minor Midgets.